Carnation Auto Blog: Will You Buy Ashok Leyland’s Stile? Will You Buy Ashok Leyland’s Stile? Ashok Leyland is known for making commercial vehicles in India. 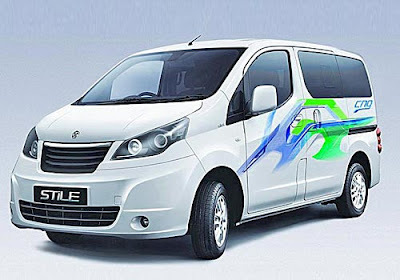 Stile will be its first passenger vehicle, which is a 8 seater MPV based on the Nissan Evalia. You can say, it's the cheaper version of Nissan Evalia. This vehicle will be available in both petrol and diesel variants. Even CNG kits will be available. Few cosmetic changes like new wheels, headlamps, grille are made to Nissan Evalia for creating Stile. This MPV will have 1.5 litre diesel engine powered by Nissan that will deliver maximum power of 85 PS. It has 5 speed manual gearbox. But the real question is – Will you buy Ashok Leyland Stile? The month of June and July was very hectic with so many new cars launched and there’s that ever looming automotive slowdown. Will cars from brands like Ashok Leyland appeal the general mass? Will you go for a car from a company which earlier made trucks and buses with no experience with car owners who are basically much polished people than truck or bus drivers/ owners? How will they manage the post sales problem, is everything in place for Ashok Leyland is the question. If you look at the MPV, the car has no style as such. Basically Leyland’s Stile lacks the Style quotient. Indian automotive market is huge compared to Europe however cars that have no brand name to flaunt hardly appeals people, it won’t be able to capture the whims and fancies of a prospective buyer. Ashok Leyland Stile is jumping into the auto market to face bestsellers like Toyota Innova and Chevrolet Tavera. It will be difficult for Ashok Leyland to sell this MPV for sure. Stile will come with a price tag of Rs.7 lakh. Ashok Leyland collaborated with Nissan to produce this MPV. Ashok Leyland’s Stile was first showcased in Auto Expo 2012. Some of the latest features available in this car FM radio, Bluetooth, USB port, tubeless tire, fuel gauge, digital clock etc. The chances of this car to do well in Indian market are too low. These are only my opinion; you can share your views.